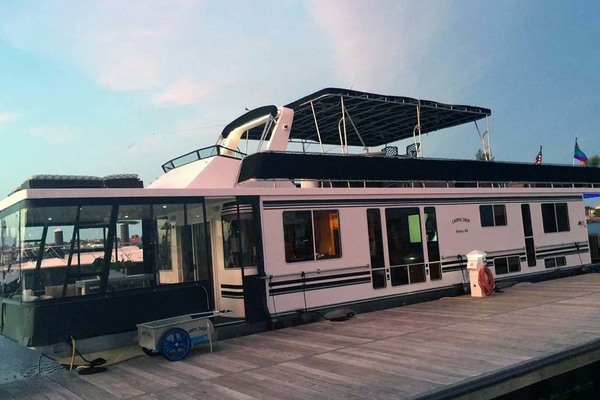 (LOCATION: Palatka FL) The Jamestowner Veteran 64 is a houseboat designed to be a vacation getaway or home with room to enjoy the fresh air and warm weather. Enjoy the view or change it when the urge comes. There’s space for everyone and everything. On deck we have two levels of decks beginning on top with a large sun deck. It features lounge seating with room for sunbathing, relaxing, or entertaining. Down one level and we have an aft deck with room for relaxing, fishing, or swimming. Side decks take us forward to the large foredeck and casual seating and dining area. The food tastes so much better when you are surrounded by warm weather and cooling water. The salon is open with helm station forward, sleep sofa, easy chair rocker, and dining table with chairs. The galley is equipped with stand up refrigerator/freezer, spacious countertop with large sink, and gas range with oven. With three staterooms and two heads there is room for friends and family. Power is provided by Johnson 90-hp outboard. Mechanical features include an 12.5-kW generator and dual reverse cycle central AC units. If you are looking for an affordable weekend or vacation getaway you should call now for more information and to schedule a showing of this Jamestown Veteran 64. She is for sale as is, where is.